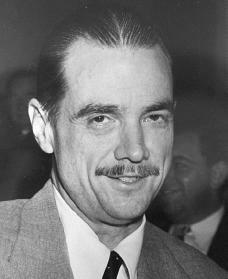 Howard Hughes was a colorful and flashy businessman and inventor who used an inherited fortune to achieve a national reputation in the motion picture and aviation industries. Howard Robard Hughes was born in Houston, Texas, on December 24, 1905, the only child of Howard Robard Hughes and Alene Gano Hughes. His father earned millions by inventing special machinery for the oil industry. He attended private schools in California and Massachusetts and was very inventive as a child. At the age of twelve he made a radio transmitter out of an electric doorbell, and later he made a self-starting motor for his bicycle. At the age of fourteen he made his first airplane flight. Hughes then attended the Rice Institute in Houston, and the California Institute of Technology. His mother died when Hughes was sixteen and his father just two years later, leaving him an orphan with an estate worth $871,000 and a patent (right to ownership) for a drill bit used in most oil and gas drilling that brought large revenues to the family's Hughes Tool Company, manufacturers of the bit. Hughes left school to take control of the company, using its profits to finance a variety of projects, which he hoped would make him a legend in his own time. In 1925, at age twenty, Hughes married Ella Rice and moved to Los Angeles, California, (they separated in 1928). In 1927 Hughes entered the motion picture business and produced such films as Scarface (1932), and The Outlaw (1941), and the box-office smash Hell's Angels (1930). He discovered actors Jean Harlow (1911–1937) and Paul Muni and made Jane Russell (1921–) a well-known star. While living in Hollywood, California, the multimillionaire movie producer led a relatively quiet lifestyle. He lived in small apartments or rented homes and rarely participated in Hollywood's social world of the rich and famous. In 1928 Hughes obtained a pilot's license. His interest in aviation (flying) led him to found the Hughes Aircraft Company in Glendale, California, in 1932 and to design, build, and fly record-breaking airplanes. He set a world speed record in 1935, transcontinental (crossing a continent) speed records in 1936 and 1937, and a world flight record in 1938. Hughes was honored with the Harmon Trophy and a New York City ticker-tape parade after his world flight. He was awarded the Collier Trophy in 1939, the Octave Chanute Award in 1940, and a Congressional Medal in 1941. In 1939 Hughes began work on an experimental military aircraft, and in 1942 he received a contract to design and build the world's largest plane, a wooden seaplane, later nicknamed the "Spruce Goose." It was supposed to serve as a troop carrier in World War II (1939–45). Hughes suffered a nervous breakdown in 1944 and was critically injured in the crash of his experimental military plane in 1946, but he recovered and flew the huge seaplane the next year. As a result of these aviation activities, Hughes became a popular public figure because his image represented the traditional American qualities of individuality, daring, and imagination. He was named to the Aviation Hall of Fame in 1973. The Hughes Aircraft Company became a major defense contractor after World War II. As the profits of the company increased, Hughes became obsessed with avoiding taxes and in 1953 created the Howard Hughes Medical Institute as a sophisticated tax shelter to which he transferred the profits of the aircraft company. In 1956 Hughes loaned $205,000 to future President Richard Nixon's (1913–1994) brother Donald in a successful effort to influence an Internal Revenue Service (IRS) ruling on the medical institute. Hughes made secret contributions of $100,000 to the successful Nixon presidential campaign in 1970 and was able to prevent enforcement of the Tax Reform Act against the medical institute. Hughes continued to use profits from the tool company for other ventures, including the creation of Trans World Airlines (TWA), in which he had begun investing in 1939.
golf courses, a television station, an airport, and land in Las Vegas, Nevada. In 1972 the Hughes Tool Division, the basis of the Hughes fortune, was sold. The holding company was renamed Summa Corporation and its headquarters relocated to Las Vegas, where Hughes had moved his residence. From this point on Hughes's career accomplishments were minimal. His obsession to control every aspect of his environment turned him into a recluse. He was seen only by a few associates and remained isolated from the operations of his company. In 1970 he left the United States, and moved from place to place—the Bahamas, Nicaragua, Canada, England, and Mexico. He always arrived unannounced in luxury hotels and took extreme precautions to ensure privacy. Hughes saw only a few male aides, worked for days without sleep in a black-curtained room, and became emaciated (thin from starvation) from the effects of his diet and the excessive use of drugs. Hughes's concern for privacy ultimately caused controversy, resulting in a scandal over his supposed memoirs (writings of personal experiences) by author Clifford Irving that sold for $1 million before being proven to be fake. The Hughes conglomerate (a group of diverse businesses) became involved with the Central Intelligence Agency (CIA), and in 1975, built an undersea exploratory drilling ship which was actually used by the CIA to attempt to recover a sunken Soviet (Russian) submarine. The company retained a Washington, D.C., public relations firm that was also involved with the CIA, which led the Hughes corporation to become involved in the "Watergate" affair, a scandal that ultimately lead to the resignation of President Nixon in 1973. Hughes died on April 5, 1976, on an airplane that was taking him from Acapulco, Mexico, to a hospital in Houston for medical attention. Hughes was controversial even after his death. Several wills appeared, one of which was found in the Mormon church in Salt Lake City, Utah, but all were later declared to be forgeries. Bartlett, Donald L., and James B. Steele. The Life, Legend, and Madness of Howard Hughes. 1979. Hack, Richard. Hughes, the Private Diaries, Memos, and Letters. Beverly Hills, CA: New Millenium Press, 2001. Keats, John. Howard Hughes. New York: Random House, 1972. Phelan, James. Howard Hughes: The Hidden Years. New York: Random House, 1976.